to step forward and create note cards, journals, matchbooks, or anything else that you fancy! 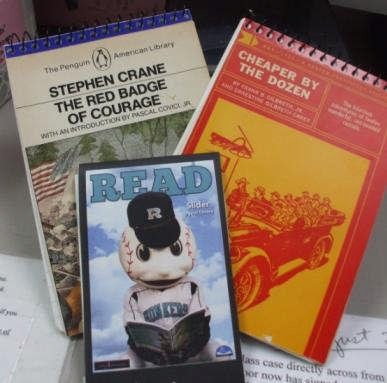 The spiral notebooks pictured here were made with book covers from books that were too damaged for the store. If you are interested in helping with this project, contact Elizabeth Ritman. The crafters met for the first time on September 6, and have continued to meet monthly to exchange ideas, help with other crafts (some add ribbons, others stickers, etc!) but would welcome new members. The group would also be glad for any donations of ribbon, yarn,beads, and buttons. Most of the work is accomplished at home, meetings are not mandatory, but we are looking for crafts especially to sell during the holiday season! Recently you may have received our annual membership letter asking you for financial support. Stop by the Library or the Bookstore if you did not receive this mailing and ask to join! We are grateful for your partnership with us, especially in this challenged economy. Your annual dues and contributions are important because they help the Friends and the Library (and hence the community) in many ways: buying or replacing equipment, sponsoring innovative programming, promoting early childhood literacy, etc. What will we do for you in return? plus four newsletters throughout the year to keep you informed about Friends activities. Please be generous. Your renewed commitment to the Library and the Friends is urgently needed and will be deeply appreciated. The Friends’ Bookstore is run entirely by volunteers. Last year the bookstore donated $55,000 to the library; this year their goal is $60,000. These funds benefit the library in a variety of ways in which we’ll talk about in a later post. Today I want to focus on the volunteers who make this happen. As you may or may not know, most of the books that go to the bookstore are donated by generous community members. Without these donations there would be no bookstore and a smaller collection of materials in the Library, since the Library looks at all donations first. Sorters look over each donated book and sort them in groups such as: library collection, online sales, auditorium sales, Bookstore, etc. Bookstore cashiers stock shelves, keep the store tidy, interact with customers, organize books in the back room so the books are ready to go out on the shelves, keep the discard’s cart full, and take care of Paige Turner. Delivery Drivers – Friends Bookstore volunteers deliver books to Channel One, where clients may pick up free children’s books, or adult non-fiction and fiction. They deliver books to places in town such as the Gift of Life Transplant House so those who are here waiting for treatment at Mayo Clinic have adequate reading materials. Operation Paperback – Friends gather requests from American soldiers stationed in Afghanistan, Iraq, and all over the world and ship donated books to them. The Friends also send a variety of additional books in most genres in case they have not been able to submit requests. Read With Me program each baby born in Olmsted County receives a book bag containing his or her first book. Adopt-a-library – Friends have adopted libraries in other communities and helped them to fill out holes in their collections when we have multiple copies of books or when the library suffers from natural disasters such as floods, tornadoes, etc. Community Events – Friends attend local events such as the ArtiGras and ArtWalk and Poetry Conferences, and sell books and materials to these specialized audiences. Fundraising – Friends volunteer to give up their Saturday mornings in order to conduct the Second Saturday Sales in the Bookstore as an additional fundraiser. They also help with special fundraisers, such as icecream socials or teas. Administration – No business can be a success without good management. The Friends have committees who take care of the business end of things such as scheduling, training, accounting, marketing, etc. The Friends’ Bookstore is a great asset to the Rochester Public Library and appreciated by all the library staff. At our 2nd Saturday Sale on July 9, we made over $538.00. Pat Stephenson is in charge of those sales, and she could use your help. The commitment would be one Saturday in the year, from 9 AM to about 1:15 PM. These sales are fun and a great fundraiser for us, and we need volunteers to help out with setting up tables, putting out books, and talking to customers. Contact Pat or inquire at the store. 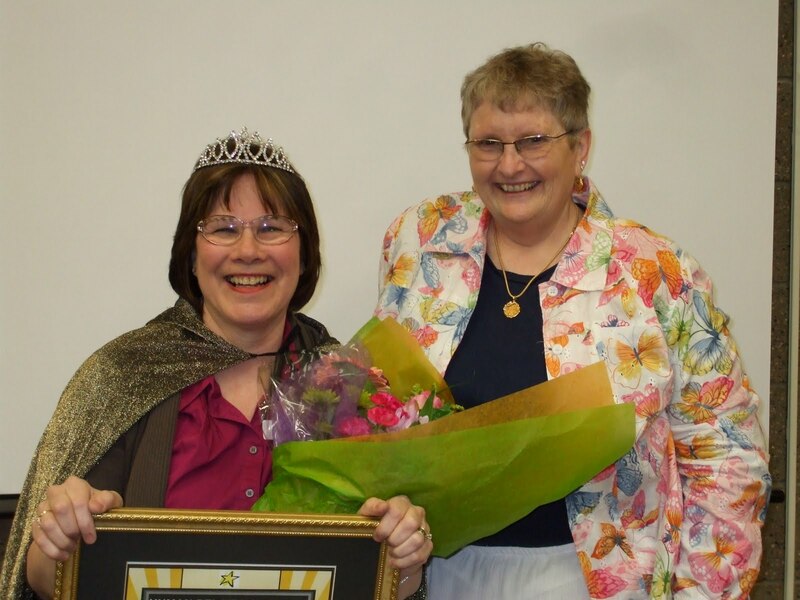 It is lovely to recognize our wonderful volunteers. Pat Stephenson has been such a magnificent supporter of the Rochester Public Library and a great Friend to all. Many people asked after the song “Sisterhood of Books” that was written for Pat’s award last month so we have reproduced it here for you! All together now! from the play How to Succeed in Business Without Even Trying. Pat leads the sisterhood of books. Pat leads our sisterhood of books! AND – if you are missing Pat’s suggestions for books try the Readers Choice (200 Book Club Favorites) by Victoria Golden McMains (2000) who collected suggestions from more than 70 reading groups nationwide. There are some interesting plot synopses with intriguing quotes and questions for your bookgroup. There are a number of great blogs too. Sue McMillian was my Confirmation sponsor and as my sponsor she was helping me come up with ideas for community service projects. Since she volunteered at the Friends Bookstore she asked me if I would like to do one of my projects at the Winter Book sale in the auditorium. I had a lot of fun volunteering that day, partially because I was surrounded by books, but I have to admit the cookies were an important part too. I met Gail Harris that day and she had me fill out a volunteer form. That summer in 2009, when Sue was scheduled in the store I went with her. The bookstore and I, you could say, fell in love with each other because I have not left yet. I have always liked reading books and that is why I have spent so much time at the library and the bookstore. I think libraries are misunderstood by so many people, mainly teenagers, these days because when they think of libraries they associate it with school and studying but they are so much more than that. Yes, the library is useful for school but it is also a place where you can go somewhere else entirely just by sitting down and reading. It is also a place for people to go if they need to get away from their daily lives and read the newspaper, pick up their favorite magazine, find a movie to enjoy with their families on a Friday night, or just to take one of the many, useful classes that happen at the library. One of my favorite memories from the library before I started in the bookstore, was the photography class I took when I was in middle school. I still have the pictures from that class and still have an interest in photography due to the fun I had taking that class. Everyone I have met that works or volunteers at the library, is always willing to help you with whatever you might need and is always good for conversation or some funny story. Those people are part of the reason I keep going to the library because they always make it entertaining. They are also full of good ideas on how to improve the library or create something to help other people. The many things the library offers, like the homework help, different book groups, movie nights, story times for children, and the activities that are offered for the whole family are reasons that make our library special. I think any place that is open for anyone at any age, is a good thing. I encourage other people to go to the Library as well as volunteer. On most Sundays and a couple Saturdays, I volunteer in the bookstore. I enjoy going every week because I never know exactly what I will be doing until I get there. There was one week I got to the bookstore and there was a message on the phone. This lady said that her husband had donated some special books of hers and she did not know until after he had donated them and she wanted them back if that was possible. I called her back and got information on what the books looked like and began searching for them. It was not until a couple hours after searching for them that I called her back and told her I had no luck. As I was talking to her I realized that the area code was not in Minnesota and asked where she was calling from. She was from Rochester Hills, Michigan and had called the wrong library. That is just one of the many entertaining things and I never know if I will find something that they didn’t even know they wanted. I like how I can count on a few customers to come in every Sunday and now I know their names. I have had customers bring me in pictures of their wedding or a graduation because they know I will be there. I also like when whoever I am working with asks me to take books out of their hands if they try to buy anything because even though one book may not cost much, if you’re in there for three hours you could walk out with no money. One of my other favorite parts of working in the store is the wide-variety of people that come in. I have seen people from New Jersey, Colorado and New York because they are here visiting Mayo Clinic. There are also the people that only come in every couple of months when they visit family but make sure that they stop in the store before they leave town. There was one man I met a couple of months ago who said he was in town visiting his family and had been out shopping with his wife all day. She had asked him to drop her off at home before he came into the store because he takes too long when he is here. He just laughed like it was not true but by the time he left I would say a good fifteen other customers had already been through the entire store and left. People like him who love books is why I enjoy volunteering in the store each week. After I graduate from high school and start college, I plan to arrange my schedule so I will still be able to volunteer because it is something I look forward to during my week and also gives me a good excuse to go to the library! people are coming before we order food, so please RSVP yes or no when you get this newsletter. You may come dressed as your favorite author; we will be giving prizes for the three best outfits. Some of last year’s characters included: Mark Twain, Walt Whitman, and Brother Cadfael.